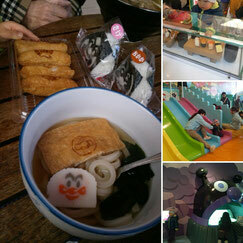 Nagoya Anpanman Children Museum you can play inside and outside, there're some food shops we enjoyed Anpanman Udon. It's located next to Nagashima Spaland amusement park, Nagashima hot sping, Mitui Outlet park.It's 30min away from Nagoya station. We have five Anpanman children Museum (Yokohama, Sendai, Kobe, Fukuoka, Nagoya) and Anpanman Museum in Kochi.